On Saturday the likes of Darryl McDermott, Oisin McMenamin and Robbie Hume got game time, but it was youngsters Mills, Gareth Muldoon and Aaron Jarvis who boss Kevin Deery was really pleased with. “You have to put the young players in because you will never learn and they won’t learn if you just keep them in and around the squad as bit part players,” he said. “Young Stephen made his full debut and done relatively well, I just feel he needs to get more involved, he can’t be in the fringes of games too much, you have think for yourself at times. 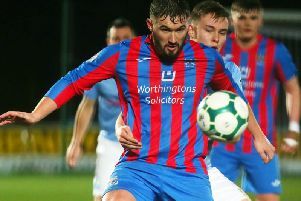 “Jarvy was excellent and while I brought him off for (Sean) Roddy I just felt he could give us that little bit extra quality with his delivery and to be fair he did with two great free-kicks which Shane (McGinty) should have scored from, but as I said you have to trust young players. “I also felt young Gareth was excellent in goals; Marty (Gallagher) was playing the game but he pulled out with a groin injury in the warm-up, so it was great character from Gareth and testament to himself that he was able to step up.